Did you wake up and found yourself wearing an orange sleeves ski jacket and it’s a 2015 the new year? It’s the same. Nothing has change. You probably went to a New Year ’s Eve Party the night before. But, when you cross the mirror in your bathroom you a get a glimpse of yourself and see that you look like Marty Mcfly (Michale J. Fox) and you scream like the Home Alone kid and you say “What the feathers happen to me?” You travel back in time 30 years ago! That’s right, you are in 1985. 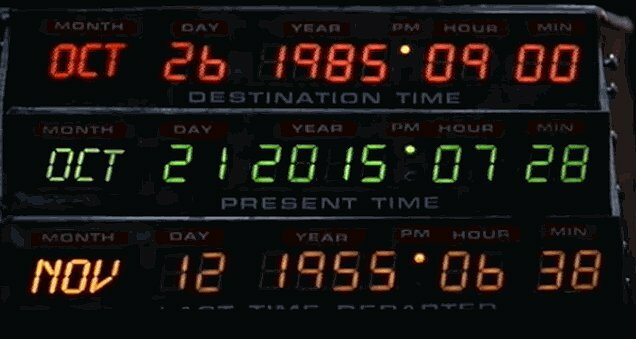 You went Back to the Future. Remember the movie? If you have not seen it. Go rent it one night or download from Netflix. Or if you weren’t born that year. You missed it. Anyway, when Robert Zemeckis was directing Back to the Future II, he did not actually predict what the future would look like. “For me, filming the future scenes of the movie were the least enjoyable of making the whole trilogy, because I don’t really like films that try and predict the future. The only one I’ve actually enjoyed were the ones done by Stanley Kubrick, and not even he predicted the PC when he made A Clockwork Orange. So, rather than trying to make a scientifically sound prediction that we were probably going to get wrong anyway, we figured, let’s just make it funny.” Robert Zemeckis. The filmmakers did their research and homework of what the future would look like in 2015. There’s the hover board and shoes that lace and tie itself, they are some proof we have it now. Other than that, it’s very impossible to have flying cars. But scientist and inventors are trying to do so. It’s a movie with possible fantasy of the future and what it would look like. However, we have cameras now and they are monitoring everything what we do. Flat screen tv’s and watching many shows at once. Ability to Skype (video chatting with friends through the internet and people we know). Head-mounted displays, and automated fueling systems. The film also correctly predicted a future where video games do not need hands (Microsoft Kinect) or, at the very least, do not need traditional controllers (Wii Remote). The movie itself is wildly predictable and what we have now is some of the possibility. We have smart phones that we use and computer programmers are making apps that we can use for everyday usage. Can the future be caught up in October 2015? And beyond? Very impossible, but we can try. But we do need fresh minds and great innovators. Make sure your children do well in science, technology, engineering and mathematics. Also English and communication.